We recently had an article published in PlantServices about the value of the NAMUR NE 107 diagnostic recommendations and how we embedded these into the FOUNDATION fieldbus specification. For those of you not familiar with NAMUR, they are an end user driven organization in that focuses entirely on process automation. One of the things NAMUR does is to write recommendations documents for various areas of process automation. NAMUR NE 107 covers recommendations for presenting diagnostic data from intelligent field devices so they can be viewed by operators in technicians in context. In other words, the diagnostic information is relevant and easy understand. The operator or technician sees only the data they need to see when they need to see it, and that data is easily understandable. We at the Foundation have built these NE 107 recommendations into our specification. With the latest version of our interoperability test kit and host profile registration process, we also make sure that all new devices and hosts that we test conform to the new specification. You can read the full article here. Embedding the NAMUR NE 107 diagnostic specifications is one advantage of having a truly open standard like FOUNDATION fieldbus. It allows us to adopt new technologies as they come along, just as we did with Ethernet and HSE. We are also doing the same with FOUNDATION for Remote Operations Management (ROM), integrating WirelessHART and ISA 100.11a protocols into the FOUNDATION fieldbus infrastructure. 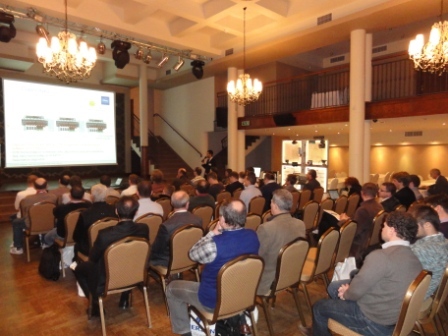 The Fieldbus Foundation Central and Eastern European Marketing Committee (FFCEEMC) is pleased with the success of its end user seminar and live demonstration of FOUNDATION technology held on Wednesday 9 November, 2011, at Hotel Tumski, Plock, Poland. Members of the FFCEEMC welcomed delegates from some of the major end users and system integrators in the CEE region including refineries, petrochemical plants, crude oil distribution/storage, pharmaceutical manufacturers, biofuel processors, chemical companies, engineering contractors and EPCs. With its theme ‘FOUNDATION Fieldbus Live’, the agenda for the day included a comprehensive program of presentations in Polish language with a specific insight into FOUNDATION fieldbus life-cycle economics. Of particular interest to attendees were the practical, live, hands-on demonstrations of the building, maintenance and modification of working FOUNDATION segments using host systems from Honeywell and Emerson Process Management together with field devices and components from several Fieldbus Foundation equipment suppliers. In addition to the presentation program and demonstration, attendees had several opportunities to discuss applications and suitable FOUNDATION solutions with representatives from the FFCEEMC member companies at a table top display during the breaks and after the close of the proceedings. Complimentary refreshments, lunch and seminar materials were provided. The FFCEEMC includes representatives from major suppliers of control systems and instrumentation including Emerson Process Management, Honeywell, MTL/Polyco, Pepperl+Fuchs, R.Stahl/ASE, Turck and Yokogawa. For more information about the function and activities of the FFCEEMC, please visit the Central & Eastern Europe section of the Fieldbus Foundation website http://www.fieldbus.org or email: cee_info@fieldbus.org. The Fieldbus Foundation Central and Eastern European Marketing Committee (FFCEEMC) once again participated in the conference program during the 17th Distributed Control Systems symposium (DCS17) on 24-26 October 2011 at Hotel Palota, Miskolc-Lillafüred, Hungary. Over 275 delegates from Hungary and the CEE region attended the three day conference organised by the Research Institute if Applied Earth Sciences, University of Miskolc. The conference program kicked off with a morning plenary session for all, followed a workshop dedicated to FOUNDATION fieldbus technology. Presentations were given by representatives of FFCEEMC member companies addressing three FOUNDATION fieldbus topics including ‘The Economies of FOUNDATION Fieldbus’ by Szilárd Szelmann (Yokogawa Hungary Ltd.); ‘FOUNDATION Fieldbus DART and Functional Safety’ by György Baradits (Controlorg Ltd.); and ‘Explosion Protection for FOUNDATION Fieldbus H1 – an Update on the Latest Solutions Including High Power Trunk, Ex ic and DART’ by Árpád Veress (Stahl Hungary Ltd.). 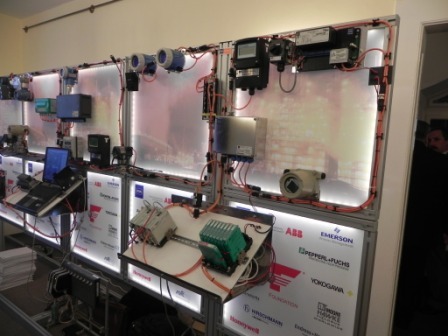 Following the success of the live FOUNDATION technology demonstration sessions at last year’s DCS16 conference, the FFCEEMC team again ran a live demonstration session using the newly commissioned demonstration units featuring three FOUNDATION host systems with fieldbus devices from different suppliers to demonstrate aspects of the technology and interoperability. Other sessions during the three day DCS17 event included various keynote speeches; presentations on smart field instrumentation; DCS plans, DCS applications and DCS and connecting systems; and the International Scientific workshop. Speakers included several end users and industry experts – including representatives from several of the Fieldbus Foundation’s member companies. In addition to the speaker program, attendees were also able to visit an exhibition featuring displays from 13 exhibitors during the breaks and evening drinks receptions. The University of Miskolc has reached a significant milestone in its application to become an accredited training site that offers fieldbus training courses certified under the FOUNDATION Certified Training Program (FCTP). A license agreement has been signed that recognises the site as a certified training centre that is undergoing the rigorous process of auditing its educational curriculum and instructors in order to achieve full certified training centre status. Once successful in the complete accreditation process, the University of Miskolc will become the preferred site for Fieldbus Foundation training in the Central & Eastern European region. The Fieldbus Foundation conducted an end-user seminar in Brisbane on the 2 November followed by Perth on the 4 November as part of “the future is digital” road show around the Asia Pacific. Participating manufacturers include ABB, Azbil (Yamatake), Dresser, Emerson Process Management, Honeywell, Leoni, MooreHawke, MTL, Pepperl+Fuchs, Rockwell Automation, Samson, Softing, Stahl, Turck, and Yokogawa. Here is a report on the seminars written by Jonas Berge, longtime fieldus expert at Emerson Process Management in Singapore. “The keynote address noted how everything around us is benefiting greatly from a transformation from analog to digital such as television, telephony, and music. The latest developments in fieldbus deliver on the promise of digital networking. Fieldbus since years ago reduces wiring and the number of I/O cards. Now, with fieldbus power integrated into the interface card, the marshalling panel can also be eliminated, further reducing system footprint. It is well known that fieldbus takes the place of 4-20 mA, but fieldbus also takes the place of on/off signals. For instance, fieldbus on/off valves eliminate three wires per valve, provide feedback, and diagnostics. Similarly, for electric actuators / motor operated valves (MOV) more than a dozen wires per valve can be eliminated. In a fieldbus design an on/off valve can easily be changed to a control valve or MOV without redesigning wiring, barriers, or I/O cards because they have one and the same electrical connection. All the signals are marshaled from software, known as virtual marshalling or soft-wiring, which gives great flexibility to accommodate changes late in projects. Multi-input temperature transmitters take the place of eight single input transmitters and associated wiring, ideal for temperature profiling applications on reactors. FOUNDATION fieldbus is taking the place of proprietary protocols for networked MOVs. Similarly, a fieldbus-based tank gauging system uses only a single pair of wires to connect all sensors on the tank and is intrinsically safe. This reduces wiring and eliminates need for flameproof installation methods. Diagnostics for all sensors is provided. 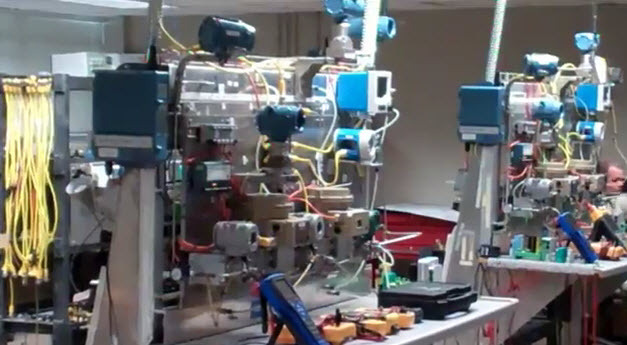 A field mounted gas chromatograph eliminates the need for analyzer shelter and long sampling lines, instead using fieldbus as an “electronic sampling line”. Gas chromatographs and other analyzers can be digitally integrated with the rest of the system. 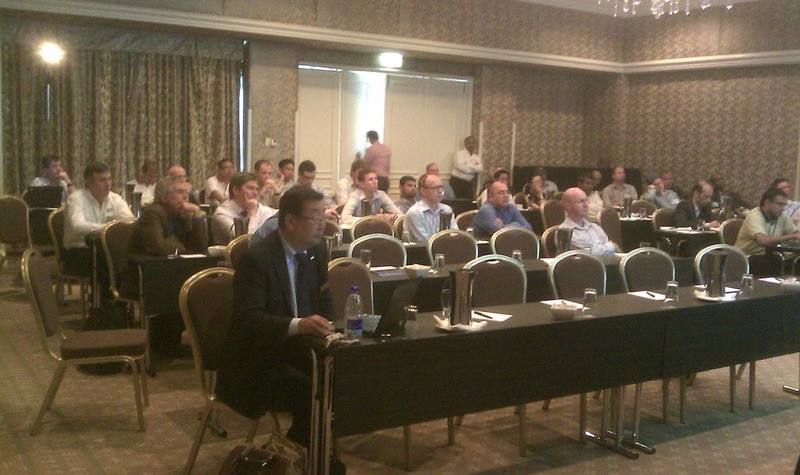 The main part of the seminar gave an update on the project benefits of fieldbus at the various stages of a project including FEED, detail design, and installation & commissioning in view of the many enhancements to the fieldbus technology and fieldbus products and systems over the past several years. The second part covered life-cycle operational excellence and maintenance benefits. An end-user presentation was given by Ambrose Hargan of CSBP, who has reaped the real benefits of fieldbus for several years and has already deployed three systems. As an early adopter of FOUNDATION fieldbus, they found that the technology has matured and their experience grown. Using fieldbus and its associated tools and practices is now much easier. Recommendations included training on fieldbus and working with contractors experienced in fieldbus. Mexico City Seminar Coming Soon! The Fieldbus Foundation depends a lot on the efforts of our regional and country level marketing committees. Our Mexican marketing committee has organized and end user seminar in Mexico City on November 10th at the NH Hoteles Mexico City. You can view the agenda here. This promises to be a great event with a very hands-on approach to demonstrating the value of FOUNDATION technology. The STC-Group in the Netherlands is one of our certified training partners. Recently, they opened new and renovated facilities at its premises in Brielle, near Rotterdam. The improved process and maintenance industry training facilities at Brielle will enhance the training experiences of delegates attending the fieldbus training courses offered by STC-Group under the FOUNDATION Certified Training Program (FCTP). In 2009, STC-Group’s Brielle facility was one of the first educational institutions worldwide to offer fieldbus training courses certified under FCTP. This program establishes uniform standards for fieldbus educational curriculum around the globe, and defines acceptable levels of learning for students of the technology. You can read more about the FCTP program on the Fieldbus Foundation web site. Earlier this year, the Fieldbus Foundation certified Dr. Bindert Douma as a FOUNDATION certified instructor on behalf of STC-Group. Dr. Douma has an extensive process automation background at Shell Global Solutions, a leading global energy company. Recognition under the FCTP means that FOUNDATION fieldbus training courses are taught at a certified training site, by a certified instructor, using certified curriculum. The core instructional content, developed by a team of qualified instructors from various institutions worldwide, is consistent across all the training facilities. For educational institutions, there are rigorous procedures for gaining FCTP status, and for certifying course instructors and curriculum. Certified training centers are required to maintain multiple hosts and devices onsite in order to demonstrate competence with fieldbus technology. They are also audited to ensure their course material adheres to set instructional standards covering fieldbus segment limits; device replacements; commands, icons, menus and screen designs of different software packages; and communication, scheduling and function block assignments enabling configuration. At its facility located in Brielle, the Netherlands, close to the Rotterdam-Europoort industrial areas, STC-Group has established a unique training centre for process control and automation. The combination of complex simulation facilities and hands-on training gives students a chance to enhance their theoretical knowledge and gain user experience by working on real fieldbus equipment and configurations. STC Brielle also offers portable fieldbus training units that can be brought to customer sites anywhere in the EMEA region. Earlier this summer I attended a conference for our Fieldbus Certified Training Partner (FCTP) program. This conference was held at one of our certified training centers at Lee College in Baytown, Texas. Chuck Carter, our primary instructor at Lee College, gave us a tour of the fieldbus lab as well as their training facilities for process automation, analytical instruments and their pilot plant. I pulled everything together in a video that you can access at the Fieldbus Foundation YouTube channel.